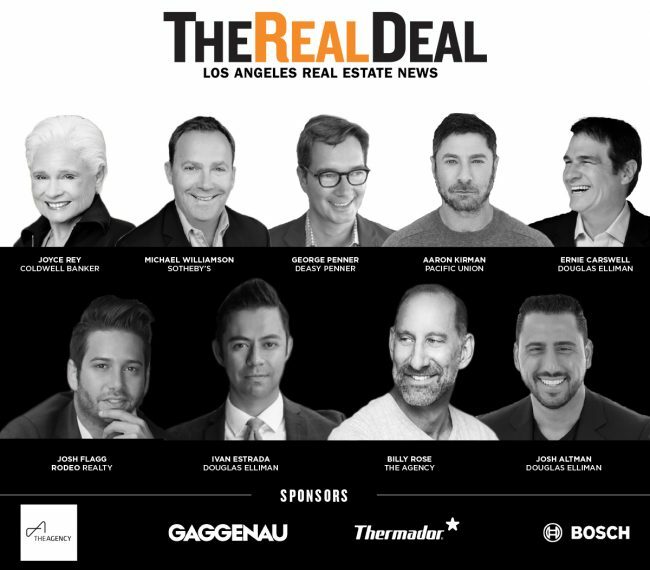 The Real Deal is hosting its annual Los Angeles Residential Showcase and Forum on Friday, June 21st at The London West Hollywood. This year’s forum will focus on how social media and guerrilla marketing play into securing exclusive listings, as well as analyze the impact of new trends and challenges in L.A.’s hottest neighborhoods. The TRD team has already secured a powerhouse lineup of speakers that include Joyce Rey of Coldwell Banker; Michael Williamson of Sotheby’s; George Penner of Deasy Penner; Aaron Kirman of Pacific Union; Ernie Carswell of Douglas Elliman; Josh Flagg of Rodeo Realty; Ivan Estrada of Douglas Elliman; Billy Rose of The Agency; and Josh Altman of Douglas Elliman. Check out our event page daily for the latest forum updates. Sponsorship opportunities and tickets are still available, but selling out quick! For more information, visit our event site.